Background: Ginkgo biloba is a natural medicine used for cognitive impairment and Alzheimer’s disease. The objective of this review is to explore the effectiveness and safety of Ginkgo biloba in treating mild cognitive impairment and Alzheimer’s disease. Methods: Electronic search was conducted from PubMed, Cochrane Library, and four major Chinese databases from their inception up to 1st December, 2014 for randomized clinical trials on Ginkgo biloba in treating mild cognitive impairment or Alzheimer’s disease. Meta-analyses were performed by RevMan 5.2 software. Results: 21 trials with 2608 patients met the inclusion criteria. The general methodological quality of included trials was moderate to poor. Compared with conventional medicine alone, Ginkgo biboba in combination with conventional medicine was superior in improving Mini-Mental State Examination (MMSE) scores at 24 weeks for patients with Alzheimer’s disease (MD 2.39, 95% CI 1.28 to 3.50, P<0.0001) and mild cognitive impairment (MD 1.90, 95% CI 1.41 to 2.39, P<0.00001), and Activity of Daily Living (ADL) scores at 24 weeks for Alzheimer’s disease (MD -3.72, 95% CI -5.68 to -1.76, P=0.0002). When compared with placebo or conventional medicine in individual trials, Ginkgo biboba demonstrated similar but inconsistent findings. Adverse events were mild. Conclusion: Ginkgo biloba is potentially beneficial for the improvement of cognitive function, activities of daily living, and global clinical assessment in patients with mild cognitive impairment or Alzheimer’s disease. 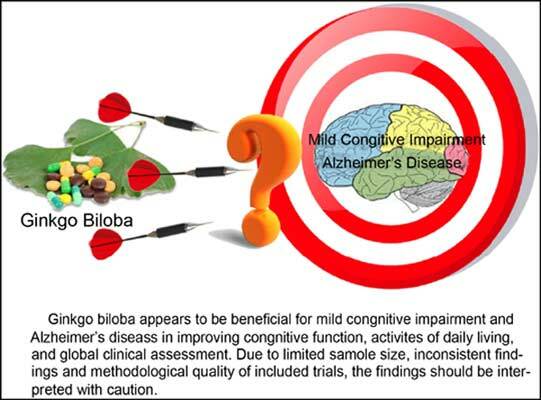 However, due to limited sample size, inconsistent findings and methodological quality of included trials, more research are warranted to confirm the effectiveness and safety of ginkgo biloba in treating mild cognitive impairment and Alzheimer’s disease. Alzheimer’s disease, Ginkgo biloba, Meta-analysis, Mild cognitive impairment, Randomized controlled trial, Systematic review.